An international team of researchers has shown that specially treated drops of oily chemicals can take on bizarre shapes and structures during the freezing process. These insights could allow us to create artificial structures with very life-like properties. By using a relatively simple bottom-up approach, a joint research team from Cambridge University and Sofia University in Bulgaria demonstrated that liquid droplets of oil, when put in a soapy water solution and slowly frozen, form “plastic crystal” phases on their inside surfaces. This process caused the droplets to shape-shift into a surprising variety of forms, ranging from octahedrons and hexagons to triangles and fibres. The new research points to “morphogenesis” as a possible answer to these questions. This idea goes back to the 1950s, when Alan Turing proposed that morphogenesis is the result of local chemical reactions that cause a substance to spread through space. As this research shows, Turing was clearly on to something. By slowly freezing liquid drops of oily hexadecane floating on soapy water, the researchers coaxed the droplets into shifting through a variety of crystal-like forms. What’s more, the droplets also shifted back to their original shapes, when the solution was re-warmed. Plastic crystals are a special state of matter that is like the alter ego of the liquid crystals used in many TV screens. Both liquid crystals and plastic crystals can be thought of as transitional stages between liquid and solid. While liquid crystals point their molecules in defined directions like a crystal, they have no long-range order and flow like a liquid. Plastic crystals are wax-like with long-range order in their molecular arrangement, but disorder in the orientation of each molecule. The orientational disorder makes plastic crystals highly deformable, and as they change shape, the droplets change shape along with them. 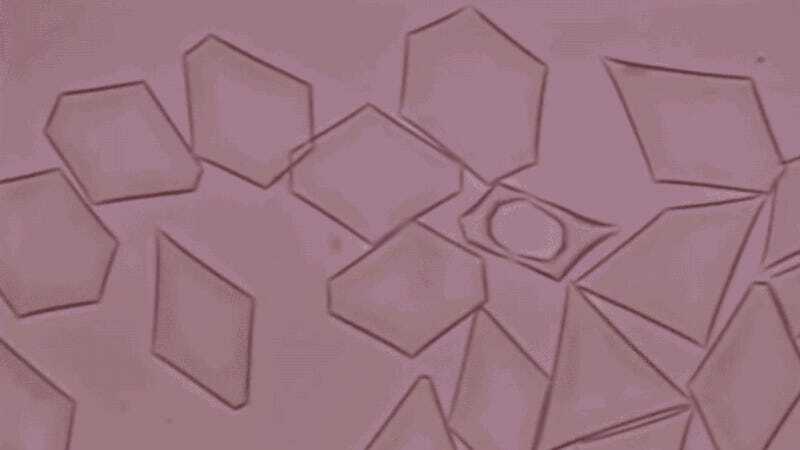 This plastic crystal phase seems to be what’s causing the droplets to change shape, or break their symmetry. And in order to understand morphogenesis, it’s vital that we understand what causes symmetry breaking. These insights could eventually help scientists and engineers create artificial structures with the same kind of control and complexity as biological systems. Novel and complex structures could be built from simple components, with potential applications in drug development, paints, cosmetics, and household products like shampoo. “It’s curious to observe such life-like behaviour in a non-living thing — in many cases, artificial objects can look more ‘alive’ than living ones,” said Smoukov. Read the entire study at Nature: “Self-shaping of oil droplets via the formation of intermediate rotator phases upon cooling”.